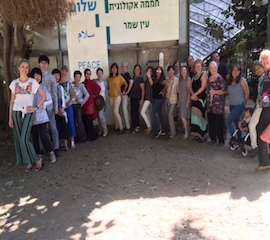 In the week of Yom Kippur, the Jewish Day of Atonement (forgiveness and repentance), eight women representing the WPPS, from Japan, France and the UK, visited Palestine-Israel to offer encouragement to those working for peace. At the Tur’an Elementary School, the teachers are integrating education with the local community. 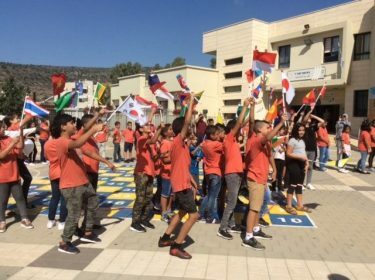 Not only are they celebrating their Arab cultural roots, but, through an art project, are collaborating with the nearby Jewish and Christian schools. Striving for coexistence, multicultural discourse and universal values. At The Ein Shemer Kibbutz, two hours north of Tel Aviv, we met “Seeds of Peace”, motivated and influential Israelis working for conflict resolution, not just in Israel-Palestine, but also around the world. Our last visit was to Kafr Qasem, a village that suffered a huge massacre of women and children, in 1056. We held a Symphony of Peace Prayers with Sheikh Raed Badir, representing the Islamic community and Eran Dubovi representing Jewish communities sharing prayers from each religious community. 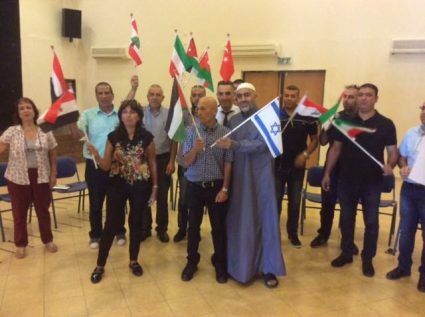 At the following Flag Ceremony, Eran Dubovi held the Palestinian flag and Sheikh Raed badir held the Israeli flag. The Kafr Qasim Massacre occurred on October 29, 1956. 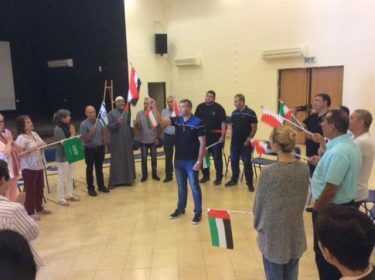 The tensions between Israel and Palestine are still apparent, the significance of this Flag Ceremony with shown flags held together gives hope for the future.